MashaAllah Supernova '18, Al Qamar's STEM fest went off beautifully. 13 schools participated in this brain buzzing, mind spinning 2 day event in which challenges kids showcased their mathematical thinking, engineering creativity and logical thinking. The Maker Fest had a challenge where children had to make a "water vehicle which carries a treasure across water, using junk material" had some very interesting results - where participants made rafts with thermocol, sponge, ice cream sticks and propelled using balloons. 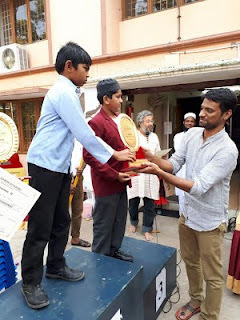 Al Fajr International won the 1st Prize with I Max, Royapettah coming 2nd and UPS third. The Strategy Games were a grueling test of mental agility. 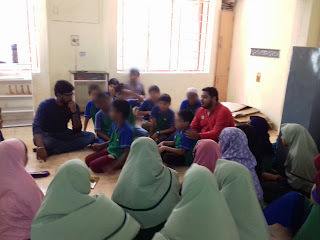 One key purpose was to reintroduce children to paper and pencil games which are sadly dying out due to the usage of tablets, mobiles and computers. The participants battled it out from 9am till 3:30 - playing several challenging strategy games Snap Cubes and Sprouts. Students from Unity Public, KP Ilm, Knowledge Academy and Al Qamar Academy qualified for the finals. Unity Public School emerged the winner with Knowledge Academy in the 2nd and KP Ilm in the 3rd place. Day 2 started with the Math Olympiad. About 80 teams from 12 schools participated. The prelims paper paper was well balanced and 15 teams from - KP Ilm, Sana Model School, Al Fajr International, Al Qamar Academy, Unity Public School, MWA, emerged as finalists. The finals were extremely challenging to say the least and had participants spend over an hour on just 8 problems of increasing complexity. The team from Al Fajr emerged as winners with Sana Model School in the 2nd place and another team from Al Fajr in the 3rd place. The Science quiz was held in the afternoon with 30 teams participating. With 7 teams from KP Ilm, MWA, Al Fajr International, Al Qamar Academy and and Unity Public School qualified for the finals. The quiz questions tested the scientific thinking, conceptual understanding and inference ability in the participants which included real live demos of physics problems. The team from Al Fajr won the 1st place with Unity Public School in the 2nd place and MWA in the 3rd place. Al Qamar students were honorary participants and not eligible for any prizes. A very interesting talk on "How to mould a smart child" was given by Hauroon Jamal, B.Tech IIT Madras & Director of Al Qamar Academy which focussed on the do's and don'ts of parenting a bright child. Safwan Samsudeen, Al Qamar's latest Asset Talent Scholar was also honoured during the event. Our students put up booths to demonstrate board games they had designed themselves. Another booth showcased the books authored by Al Qamar children. InshaAllah, Supernova will be an annual event and set a high benchmark for STEM challenges in Chennai. All praise is to Allah SWT for his constant blessing, mercy, guidance and help.